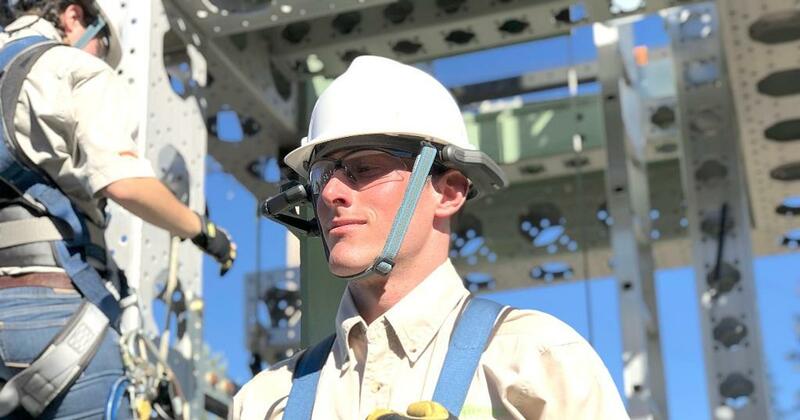 Augmented reality (AR) has a lot to offer businesses that work in the food and beverage industry. It can spark customer engagement by educating, entertaining, and showing brand transparency. Augmented reality not only engages consumers, but also inspires them to see, taste, and experience your product in a new way. 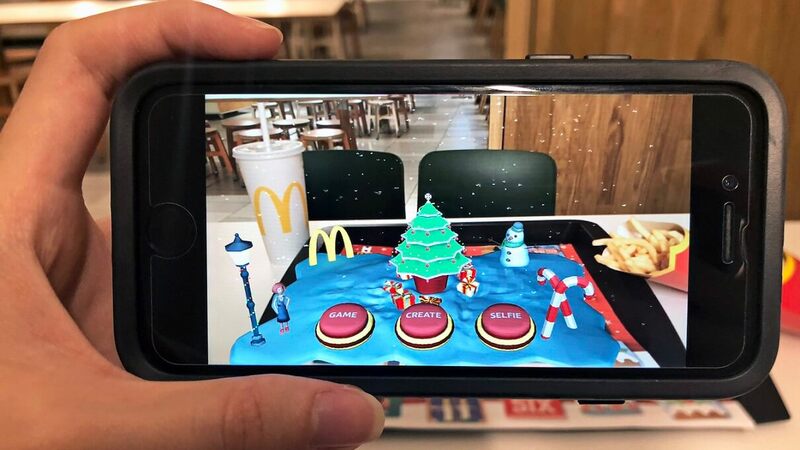 Considering the fact that consumers become more comfortable with tech innovations, some of the food and beverage companies have already found their way to use augmented reality technology. 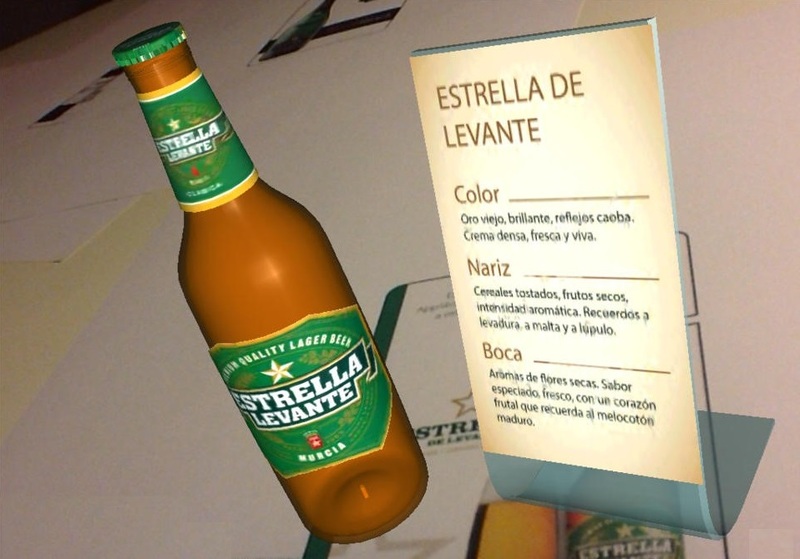 Different types of businesses that sell beverage use augmented reality in their mobile apps: from alcohol delivery services to bars and restaurants to startups, to alcohol brands and wineries. 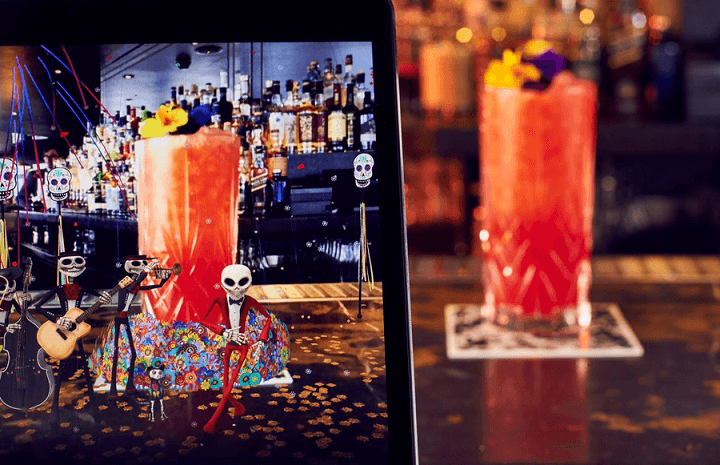 Let’s take a deeper look at the cases that reflect an integration of augmented reality technology in the drink sector, to better understand how you can implement this innovative AR technology to your restaurant, bar or other beverage business. If you run an alcohol delivery service, there are many exciting ways to create a buzz around it. The SippClub startup, for instance, has become the world’s first augmented reality wine club due to its AR mobile app, which can recognize labels and recommend meals to a particular wine. The online wine retailer SippCLUB has been extremely popular since its website launch in 2010. However, their newly launched augmented reality service could manage to grab the attention of millennials – the current UK’s most significant drinking wine audience. They drive wine sales in the country like no other generation before. To draw more customers to a wine delivery service, the startup created a kind of a virtual sommelier that provides users with tasting tips, the perfect serving temperature and what food would better compliment wine flavors. SippCLUB iOS/Android is an educative AR app that uses the augmented reality system to get subscribers engaged with every bottle of delivered wine. The augmented reality mobile app works only with bottles that are provided via SippClub’s wine-box subscription service and is about helping consumers find the best wine for their tastes and budget. Each month, subscribers are sent to their door a box of three bottles of previously selected wine for £29. 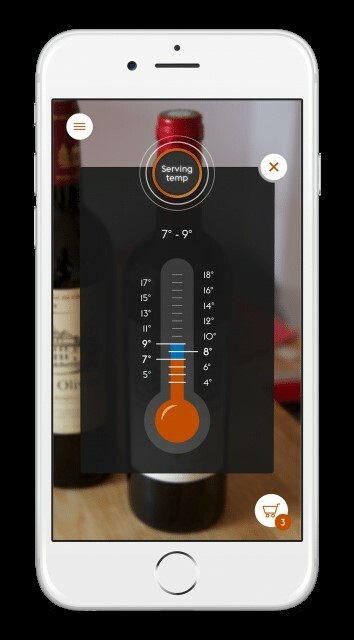 To get suggestions regarding wine, associated food, and tasting guides, a consumer has to point the mobile camera at the label, and it instantly gives all the mentioned information. Bars and restaurants can also benefit from augmented reality technology. By engaging visitors with an interactive augmented reality application, you will definitely attract more people to your bar. Visitors of Jason Atherton’s City Social restaurant-bar in London can now enjoy a new-level experience with their cocktails. Although the beverage itself remains real, the way it looks is entirely changed by the Mirage augmented reality app. 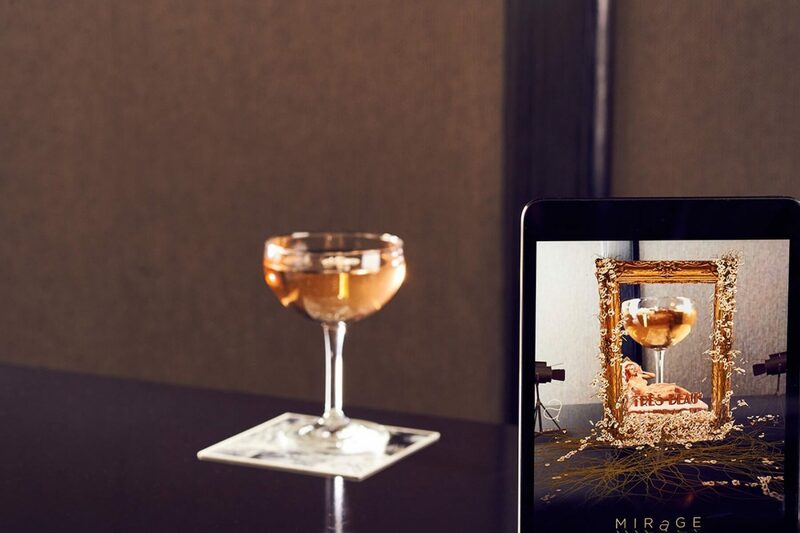 Mirage AR is an augmented reality entertainment cocktail menu that showcases new possibilities for immersive dining. Mirage augmented reality is available for both iOS and Android. The AR app works by recognizing the mat, which is served on with the chosen City Social’s drink. To get started, bar visitors have to download the AR app and then scan mobile camera over a cocktail glass. Once done, the app will fill the customer’s screen with colorful displays, frames, and illusions. Every drink gives a different experience and every single cocktail features a separate artwork: from Banksy to Van Gogh, from Pop Art to Picasso. How can alcohol brands benefit from AR? A lot of beverage brands have their brand history shown in the museums (e.g., Jan Becher Museum in Prague, Carlsberg museum in Copenhagen, and Absolut Vodka is Ahus, Sweden). No doubt, a dedicated museum brings unique experiences to your consumers. Although, with augmented reality, you can enable all your viewers to better know your brand without attending any brick-and-mortar museum. Let’s look at a few examples of alcohol brands that have augmented reality applications. Absolut released an augmented reality mobile app that takes consumers on a 3D tour to the village of Aushus, where the beverage is produced. 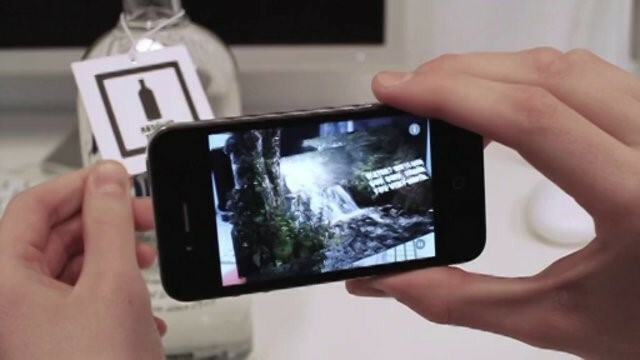 This informational entertaining AR app allows users to explore the entire process of making vodka: from the wheat fields to the distillery and the bottle they hold. The company has some successful advertising campaigns, and this one took the brand to a completely new reality. To get into a 3D tour with the Absolut Truth AR app, the consumer scans on their mobile phone a specially created neck hanger placed on the bottle. Once done, a small village in Sweden appears on the screen, along with the videos how vodka is being produced on Absolut’s fabric. Additionally, you can get a free cocktail recipe, which is convenient if you do not have any ideas for booze. Jose Cuervo has also created an innovative campaign to show its history via augmented reality technology. As a part of a company’s marketing strategy, Jose Cuervo’s informational AR mobile app turns its tequila bottle into an interactive advertisement. “History in a Bottle” is created to tell the brand’s story. Just hover over a bottle, and it will turn into the bar, Cuervo distillery, and even an erupting volcano that enriched the soil for the fruitful agave trees (of which Tequila Cuervo is 100% made). The largest Romanian home beer brand launched an AR-based mobile app that combines entertaining and navigation features: from 3D animated bear to a guiding pub locator that can take you to the nearest bar serving Ursus. The fascinating part of the AR app includes a Beer Balloon game and a few other features with the animated 3D bear. Clinking with the logo bear of the brand, the augmented reality app allows taking a picture and immediately sharing it on Facebook. If you point the camera at the beer bottle’s neck, the animated 3D bear will turn around and “open” your bottle. You can also use the Pub Navigator function, which will direct you to any Romanian pub in your area (inside of the country). In the meantime, its informational aspect provides consumers with a brief description of the Ursus beer. One of the world leaders in wine, the Treasury Wine Estates brought to life characters on the Australian 19 Crimes wine brand’s bottles. 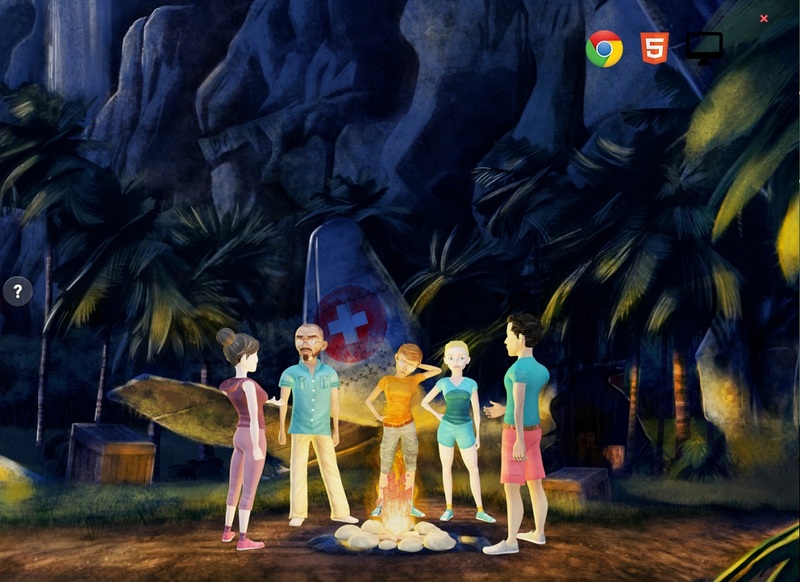 The easy-to-use augmented reality technology enables animation of the labels and prompt characters to share their story in unique monologues. To reach the young male target group and attract the audience’ attention, the company launched a strong social media campaign. To make the 19 Crimes AR mobile app work on iOS or Android device, a consumer has to hover a phone over the bottle. Once characters on the label are on the screen they start sharing their torrid stories about how they were sent across the ocean to Australia. The famous beer brand Guinness went another way and created ‘Decorate Your Pint’ as part of its Christmas marketing campaign. It was designed to help decorate a Guinness pint with Santa hat, snowflakes, gifts, and baubles and share a snapshot of the decorated pint with friends via email and social networks. Consumers can share a snapshot with the message “What I really want for Christmas…” – the company’s headline from its more significant advertising campaign. Available on iOS and Android, this simple Blippar gaming app is compatible with Guinness cans, bottles, and other branded objects and is aimed to entertain consumers mostly in pubs. 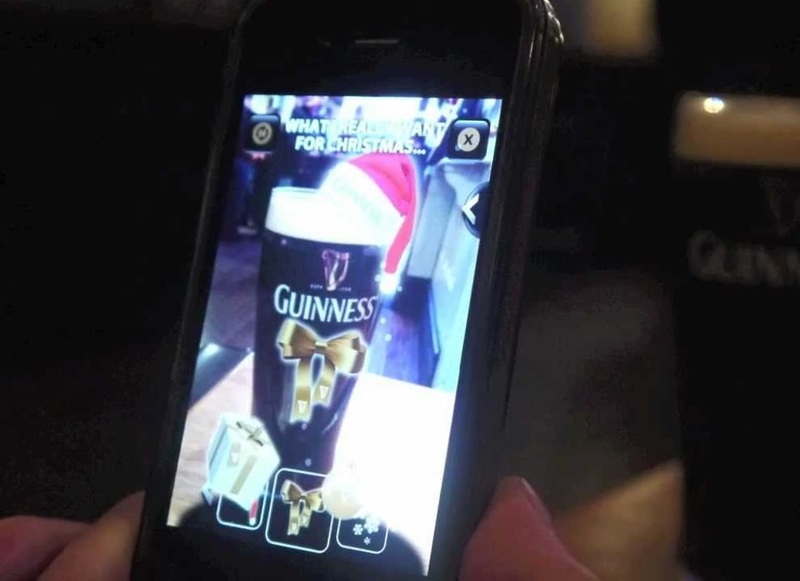 Users can complement the picture of the pint with various Christmas decorations, including falling snow and ribbons. In contrast to the mentioned above augmented reality mobile apps, Stella Artois didn’t aim to bring its customers an entertaining experience. Instead, the company launched an AR bar navigation guide app that users can use on a regular basis. The Stella Artois app for iPhone combines a live environment in the real world with augmented reality. It shows bars that sell Stella beer. Locations pop up on the screen; it gives tips on direction, and other useful information. Once the consumer is in the bar, they can easily give it a rate and send the location to friends. On top of that, the mobile app suggests calling a local taxi company, making sure that drinking won’t lead to driving. Augmented reality startups in the entertainment sector build AR mobile apps that offer marketing opportunities for beverage brands. A London-based firm Somo Global launched an augmented reality app that mixes music while consumers mix their favorite drinks. The AR Mixer literally gives voice to the bottles. 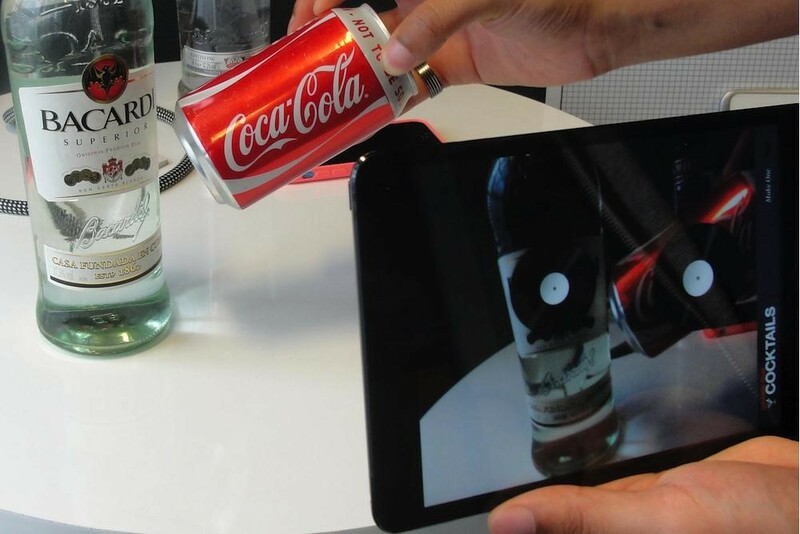 With the help of image recognition, the AR app plays music depending on a particular bottle or can: spirits play a vocal track, while mixers add a beat. This music app has no practical reasons to be used, though, it can be really entertaining. The augmented reality startup believes that “drink companies will love this as a way to sell booze” and is planning to monetize it up through future investments in alcohol and soft-drink brands. Simple to use. Consumers just have to put the bottles in front of the smartphone camera so that the AR app can recognize labels. Once done, it starts playing music. The initial idea to have each spirit and soft drink play different music, allows users to control the tracks by changing bottles and cans. It’s easy to distinguish which bottle is playing, as the augmented reality app shows a spinning record on the playing bottle. To control the sound volume, simply move the camera closer or further away – the volume will be raised or lowered. How do you bring some fun to beverage tasting events? Organizers of beverage tasting events can increase their visitor’s attention to different alcohol brands using augmented reality technology. Braingapps decided to educate customers about beverages in a new, fun, and engaging way. Thus, Braingapps built CataAR, an augmented reality app that provides extended information about the wine including its tasting note, bottle look, hints, and tips corresponding to each sort. This CataAR app was designed for a wine tasting event organized by hotel service providers. By pointing a mobile device’s camera at the bottle label or a provided display card the AR app allows to find out more information about the selected beverages. Visual enjoyment is a great part of any tasting experience, so brands embracing the virtual overlays are empowered to inspire and push consumers to action. Augmented reality is able to bridge the gap between the product content, the consumer, and the brand itself. We have successfully developed numerous solutions based on augmented reality technology for our clients from all over the world. Jasoren has been building mobile apps for a wide range of industries including retail and restaurant businesses. You can read more information in our case studies.